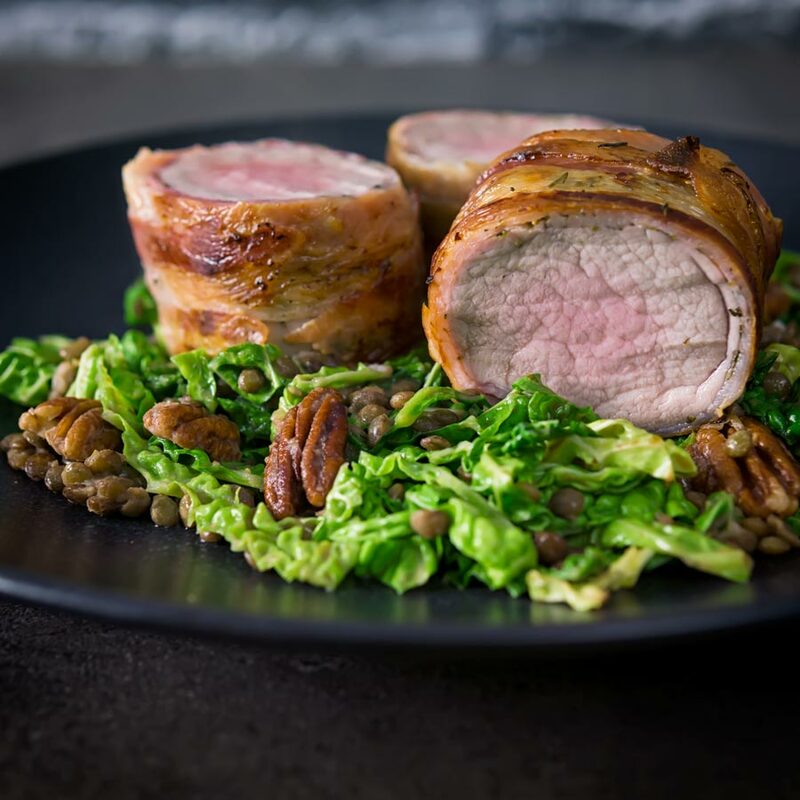 This simple bacon wrapped pork tenderloin recipe is served with a fantastic lentil, pecan nut and cabbage side dish dressed with a mustard dressing. Bacon Wrapped Pork Tenderloin With Cabbage and Lentils. The bacon wrapped pork tenderloin dish is surprisingly quick for a dinner recipe of this sort. It features the classic flavour combinations of bacon, cabbage, and mustard, many would say classically Irish. But as a Brit from the heart of the Midlands these are as common to me as roast beef and horseradish. Now I have a confession to make, I am rubbish at wrapping stuff, just ask my wife. So when I say this call this a simple bacon-wrapped pork tenderloin, it is because it needs to be. To be honest it is more rolled that wrapped! Pork tenderloin is a fantastic cut of meat, it is incredibly lean and tender which means it takes really well to quick cooking. 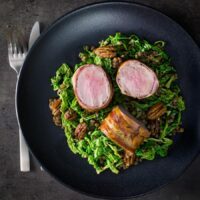 Whether it is bashed flat as in this pork and camembert recipe, or grilled in this brown sugar glazed pork tenderloin, it rarely takes long to cook. In fact, if you cook this for a long time it becomes tasteless and tough as old boots. What Temperature Should I cook Pork Tenderloin? For me that answer is hot! In this particular recipe, I cook at 200°C or 400°F for 20-25 minutes. If I were to sear the meat as in this roast pork tenderloin recipe then I would cook at a lower temperature for a shorter time. But as with all cuts of meat, this will vary depending on the specific piece of meat. As you can see I like a little pinkness in my pork tenderloin when cooked like this. As a result, I aim for an internal temperature of 63°C or 145°F. Factoring in a resting time I remove from the oven when the internal temperature reaches 60°C or 140°F. Cooking like this guarantees absolute perfect results every single time, it is not difficult. 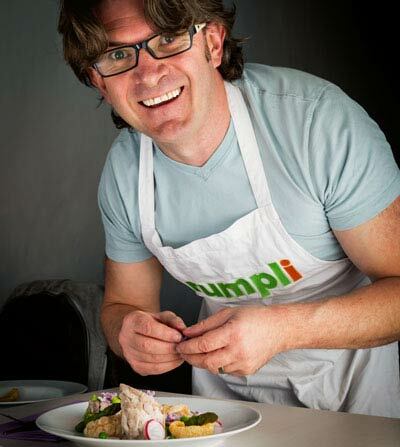 A meat thermometer really is one of the most important pieces of kit in the kitchen as far as I am concerned. Buy one, any one, I have no skin in this game! Seriously it will make your cooking better on day one! 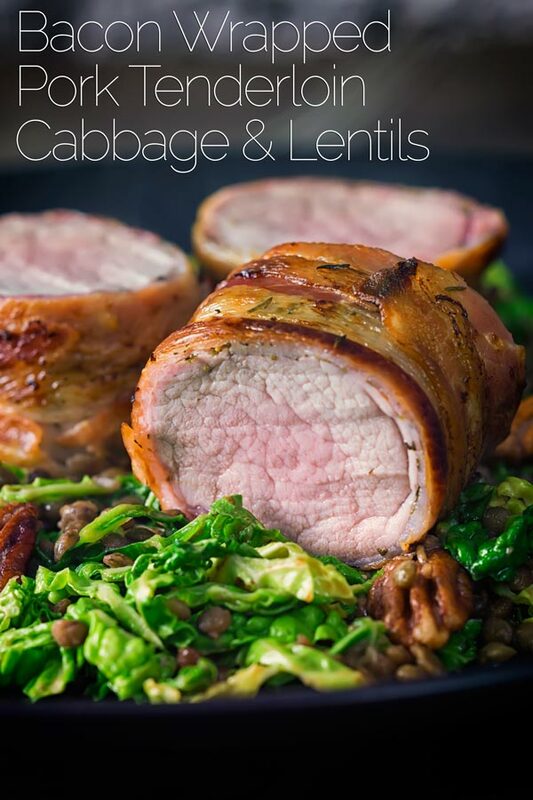 The side dish for this simple bacon wrapped pork tenderloin is a wonderful cabbage and lentil recipe. It is simple, quick and it is the perfect match for the smokey bacon flavour of the pork tenderloin. I love using lentils, as a side dish, they are often only seen as fillers for soups and stews. But choose the right lentils and they are earthy and have a great texture. 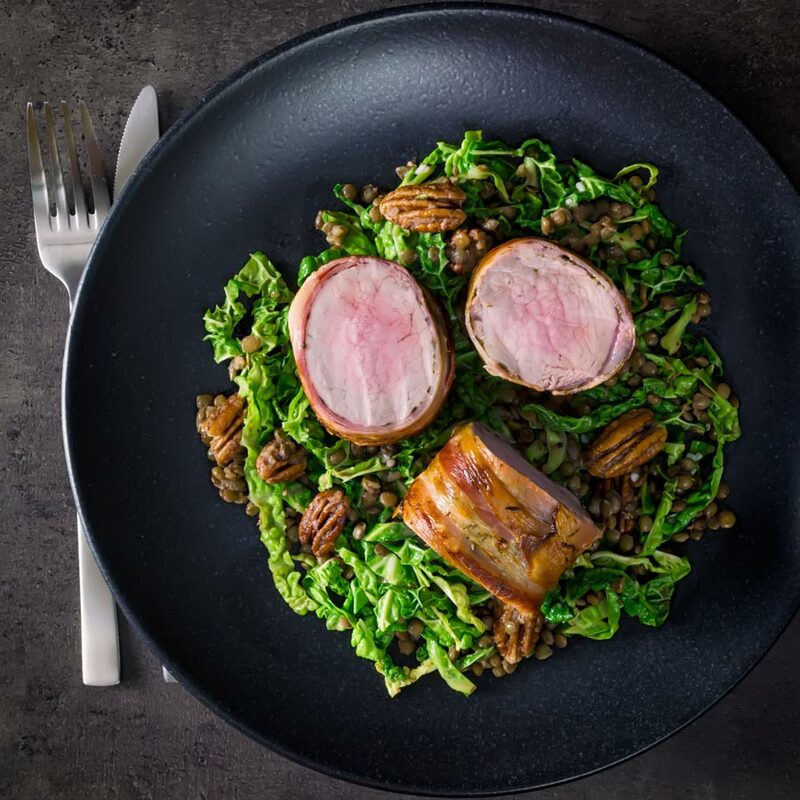 Like all lentils, you need to dress them whilst they are hot so that they can take on the flavours of the dressing. If you are looking for other ideas for lentil side dish recipes, check out this herb crusted salmon recipe. Or indeed this goats cheese puy lentil salad which if scaled down would make a fantastic side dish! Season the pork tenderloin with the white pepper and dried thyme. Wrap in the bacon rashers, do not worry about salt the bacon will contain enough to season the pork. Place the onion, garlic and bay leaf in a pan of water and bring it to the boil. When boiling add in the lentils and reduce to a simmer and cook for 25 minutes. Drop the bacon wrapped pork tenderloin in the oven and cook for 20 minutes. Whilst this is cooking remove the stalk and then shred your cabbage and grab yourself a glass of something nice, we are nearly done! When the pork is ready to come out of the oven, set it aside under a foil 'tent' to rest. Pour off the bacon fat into a pan and heat over a medium high heat. Add in the pecan nuts and toss to coat and then add in the cabbage and cook for 3-4 minutes tossing occasionally. Now drain the lentils, discard the bay leaf, onion and garlic and add to the pan with the cabbage. Mix together the ingredients for the dressing and add to the pan, taste then add more salt and pepper as required. Carve the pork adding any of the resting juices back into the lentils, before serving. I’m usually not a fan of pork tenderloin, but this look so juicy and delicious, especially wrapped in bacon. What a great recipe! My family would love this dish. It’s perfect for any special occasion. Yum! 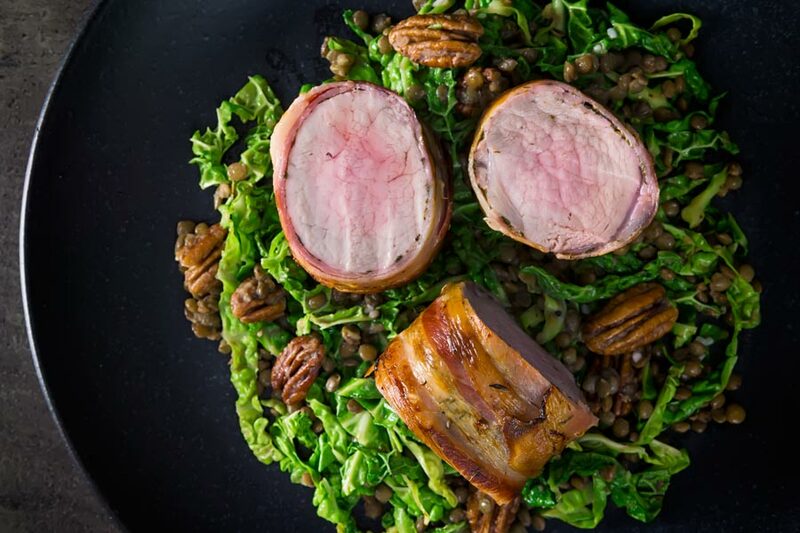 This Bacon Wrapped Pork Tenderloin sounds so tender, moist, and full of flavor! This is the perfect Holiday meat to make! I love the way these photos jump out at me I sure just want to take that wrapped pork and eat it right now it looks juicy and fantastic! Thanks Claudia, it is very tasty indeed! Love the idea of serving it with cabbage and lentils. Sounds like a lovely autumn meal. The cabbage and lentil side dish is delicious and really versatile!